If you do nothing you’re ashamed of, why would you care who watches? That’s what I think too, though it has its limits (I hope). Very creepy company….a lot of “traking” and no trusting. Yes. I fear they’ve seen deep into the human psyche and gotten rich off of it. Unsettling story. Tracking my UPS package will never be the same. Thanks! I fear that it could indeed become reality. Surveillance by law enforcement for security it one thing, but I don’t fancy being watched by everyone all the time. I don’t usually do this sort of thing but I am now.I know you are a busy man but I love the way you write and your slant on life and I just wanted to ask you to consider doing this. I am currently on day 2 at http://gillmcgrath.com/2015/06/25/the-challenge-day-2/ Holly who challenged me is found at Holly @aheartafire. Thanks, I might give it a go. I’ll make sure I have the material together first, though, since it’s consecutive days. 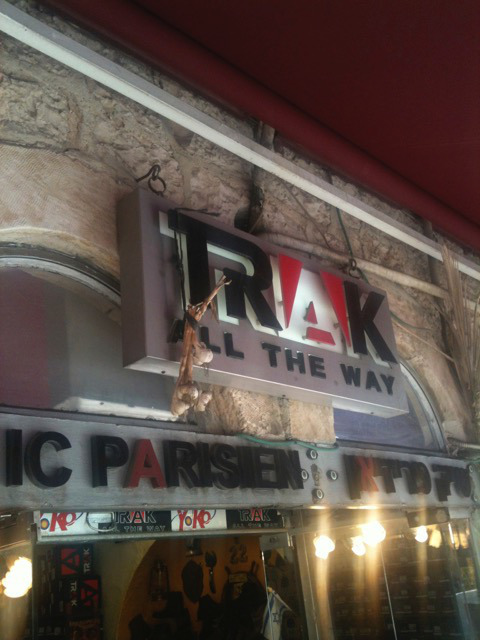 Shouldn’t Mr Trak have a ‘c’ ( for see) in the name? As it is he doesn’t pass the spell check! People like that don’t make mistakes, even when they do. He can’t even c he left the c out! Or perhaps the letter R was put in there to cover up it is tak / tack on sale! I’m okay with it as long as it’s law enforcement, I think that makes me safer. I wouldn’t fancy being watched all the time, though. Safety is more important for sure. It’s a fine line between safety and invasion of privacy, one governments are struggling with at the moment. I bet most people would get fed up after 10 minutes. I know I would! I like your take on this one. Very contemporary. Thanks! Things do seem to be going this way. Santa Claus is one of their best clients. As is Mrs. Claus, I hear…. She only needs them one night a year though, to make sure hubby isn’t making any “unscheduled stops” on the one day she lets him out. See? Your story is not far off the mark! Although I am doing nothing wrong I sure as hell don’t want anyone seeing me doing it! Ditto! Police surveillance in towns is one thing but I don’t want someone tracking me around the countryside – or at home. I laughed when everyone balked at the government getting caught – NSA. Internet businesses have been doing it for years, and probably better than the NSA. Phones, cars – yeah, they’re watching! Thank god I’m boring and ugly! The NSA’s business is security, but internet businesses are trying to make massive wads of cash by watching what we’re doing and they’re very good at it. I am SOOOOOO glad I’m not working anymore. Really. It was bad enough having bosses looking over your shoulder. The idea of them tracking you with software and cameras is just too appalling to contemplate. I retired just in time. This could be the start of a modern dystopy.. but hey.. isn’t TRAK the codename for Google? Shhh, that’s supposed to be secret… they’ll be all over you now! With many surveillance programmes, there is usually a fine line between an invasion and protection. Although I can understand why many would complain, however, if they were attacked via the net or harmed in some way which could have been prevented through the use of surveillance, then guaranteed they would then complain how there is not enough preventative measures to have stopped them. A very interesting, and as you tell, thought provoking piece. I’m glad you found my story thought-provoking. Brilliant! let us remember if we plan to be ‘naughty” we must always cover our digital tracks as Santa found out. Nothing has changed since Solomon except for the props. Great story. You always amaze me how much you can put into a few words. I judge a good story by if it pops into my head and starts me thinking or smiling at a later time. Your stories are like that. Francesca Smith makes an interesting point! It’s amazing how companies track one’s activities around the internet. I looked up TVs for my boss once and suddenly every second website I visited was trying to sell me TVs. I’m glad you enjoy my stories! For short stories I tend to stay away from flowery descriptions (which I’m rubbish at anyway!) and either do dialogue for humour or short sharp sentences to “make a point”. Francesca does make a good point (see my reply). it looks like a good candidate for hackers anonymous. It does. Let’s hope they have a good firewall! The watchers are everywhere. Are cookies a nice snack with milk, or another way Big Brother gets into our minds through our computers. Great, creepy and very realistic story. I can imagine there would be people who would be shocked to find out who was reporting on them. A lot of people did it out of fear of the Stasi, I think. These days it’s just a bit more subtle. Yes, fear played a large role in many of the “tattlers.” If you did not tell on your neighbour, the consequences could be deadly! Yes, there is a subtlety at work now. I suspect the increased use of drones will make the watching more evident! It’s that “fine line” again. Very tricky. Just replying to Phylor’s comment which I was tracking. Great great (Did I say it was great?) read on East/West Germany set both before and after the fall of the Wall is The Leipzig Affair by first-time novelist Fiona Rintoul. Best book I’ve read in ages. I really liked this. Such menacing, persuasive undertones. Well done. Thanks! I’m glad the menacing nature of the story came through. When people are completely deprived of their privacy, they aren’t free any longer, no matter if they have something to hide or not. We’re heading this way, but I think the pendulum always goes the other way eventually. Great story, I like how you include all the elements of total surveillance, especially the involvement of the big company. I’m glad you liked it! I’m not sure which is currently involved in the most surveillance – governments or corporations. I certainly don’t want my every move tracked. Very true. There’s got to be trust. Looks like we are heading that way. Loved the story. I love my oyster card but not what it tells Big Brother all about my travels. I’m sure that via Clubcard Tesco knows more about my spending habits than I do. Good story, Ali.. I imagine that at some point most of those watchers will grow rather bored and stop paying attention. You know what they say about familiarity . . . But for now, the Trak you’ve invented has a pretty creepy “Big Brother” type quality. I’m sure when they notice people losing interest Trak will find some way to draw them back in. Most people’s lives are pretty boring. I know no-one would want to watch me for long! Oh, this could happen so easily, or perhaps it already is on some level. I wonder if everyone was watching everyone would people change their behavior. Hmm. I want to know more about this one. It’s a great idea! People would be watching what they’re doing the whole time. It would be a dark world, I think. Though people largely ignore CCTV these days, it’s so normal it’s become almost invisible. Exactly. Maybe people would start to ignore it. I can see that happening, too. We’re good at ignoring things. Eventually all sorts of stuff achieves “normalcy”. I’m even getting used to seeing the occasional police officer around the place carrying a Taser rather than just handcuffs and CS spray. Still, I never bought into the outcry over my country’s collection of citizens’ email and phone activity. Of course it’s overzealous and probably illegal, but in my case must be boring as hell. I pity the poor analyst who has to spy on me! Yeah, that sales hook will grab people for sure. No-one wants to be the only one not in on it. This is a little more realistic than I want to think about. Very well done. Thanks, I’m glad you liked it! I fear that this is just around the corner. I fear that you’ve just painted a picture of the future. It has become so easy for malicious people to do huge damage that the onlyi response seems to be to watch everybody more closely. I just hope someone keeps watching the watchers. Good story. I hope so too. In fact I wanted to put the line “But who watches the watchers?” into the story but couldn’t make it fit. Orwell’s 1984 just gets closer and closer. Great theme in this story. Nice work. It’s been coming closer for a while. Clever chap, that Orwell. I had a number of things in mind when I wrote this – old East Germany, Orwell, some more modern takes. Creepy! I don’t want to think about how true this could be one day. Is that NewSpeak I hear on the wind? Yikes. This is a pretty Orwellian tale! Hopefully surveillance won’t get any more prevalent than it currently is. THought this was a fiction piece…but oh so true? Nicely done! Cameras, trackers, drones… the full works! Haha, great take on the prompt!! I love this.